Taken by Walker Evans in 1930. 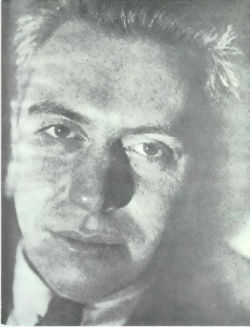 Harold Hart Crane (July 21, 1899 – April 27, 1932) was an American poet who wrote during the period of literary Modernism. Crane is one of the most challenging poets in all of American literature, as well as one of the most difficult to categorize. Crane's style is known for being incredibly complex and archaic; he intentionally wrote in a vocabulary drawn from the sixteenth and seventeenth centuries, in order to prove that the poetry of the distant past was still applicable in the present day. In part, Crane's unusual and difficult style was a result of the fact that he had no formal education in literature; he was a voracious reader and autodidact, becoming particularly fond of and inspired by the Elizabethan poets such as Christopher Marlowe, William Shakespeare, and John Donne, as well as by the seminal American poet of the nineteenth century, Walt Whitman. Although Crane was also inspired by T.S. Eliot, he was disturbed by what he saw as Eliot's pessimism. Crane devoted himself to the task of writing a new kind of modern poetry that was capable of grappling with the problems of the modern world while also instilling an optimistic vision of hope. Crane's greatest achievement, The Bridge, is an epic poem written in the grand and mythological style of Homer, that takes the Brooklyn Bridge as its subject in order to show the reader that, even in the heart of industrial New York, the poetic spirit endures. Although Crane was largely ignored by the reading public during his short life, in the years following his death he has become increasingly recognized as a major figure in the American tradition. Born in Garrettsville, Ohio, Hart Crane’s father, Clarence, was a successful Ohio businessman who made his fortune in the candy business by inventing the "Life Saver." Crane’s mother and father were constantly fighting, and in 1916, they divorced. Crane was strongly affected by his parents' divorce, falling into a deep depression, which he medicated by drinking heavily and becoming quite promiscuous. It was shortly thereafter that he dropped out of high school and headed to New York City. Between 1917 and 1924, he moved back and forth between New York and Cleveland, working as an advertising copywriter and a worker in his father’s factory. From Crane's letters, it appears that New York was where he felt most at home, and much of his poetry is set there. Raised in the Christian Science tradition of his mother, he never ceased to view himself as a pariah in relation to society, castigating himself over the guilt he felt for his homosexuality, as well as for what he felt was his responsibility in his parents' divorce. However, as poems such as "Repose of Rivers" make clear, Crane felt that this sense of alienation was necessary in order for him to attain the visionary repose that formed the basis for his poetry. The Bridge received poor reviews for the most part, and Crane himself felt he had failed to achieve his "mythical synthesis." It was during the late 1920s, while he was finishing The Bridge, that his drinking, always a problem, got notably worse. While on a Guggenheim Fellowship in Mexico in 1931-32, his drinking continued while he suffered from bouts of alternating depression and elation. He had intended to go to Mexico in order to write another epic there, about the history and struggles of the Mexican peoples, but he found this impossible as his depression increased. Nonetheless he composed what some consider his greatest single poem, the moving lyric "The Broken Tower," during this time. Crane still felt himself a failure, and just before noon on April 27, 1932, on a steamship passage back to New York from Mexico, he committed suicide by jumping into the Gulf of Mexico. Although he had been drinking heavily and left no suicide note, witnesses believed Crane's actions to be deliberate, as several reported that he exclaimed "Goodbye, everybody!" before throwing himself overboard. All links retrieved August 4, 2017. Modern American Poetry: Hart Crane (1899-1932). This page was last modified on 4 August 2017, at 15:12.